Silbury Hill in Wiltshire is huge, mysterious and awe inspiring. This gigantic hill squats on the flat Wiltshire landscape not far from Avebury Henge. It is the biggest man-made mound in Europe, comparable in size and age to the pyramids in Egypt. Until recently, no one was prepared to even guess who built it or why. Now, the latest theory is that this 130-foot high mound — 1640 feet in circumference and containing 12 million cubic feet of soil and chalk — just sort of happened. By accident. Beyond its size and approximate age there's not much information known about the hill. The best guess is that it was built around 2,400 B.C., making it about 4,400 years old. It's made of locally quarried chalk mixed with a variety of soils and experts estimate it took 4 million man-hours to move the 500,000 imperial tonnes of material to create the hill. All sorts of ancient local legends, usually involving the Devil himself, swirl around the site. According to one, Old Nick planted a gold statue in the middle of the hill. In another story, he was planning to drop this load of earth on a local town that had displeased him but was persuaded — through magic of course — to drop it on an empty meadow instead. And in yet another local story, the mound is supposed to be the burial place of a mythical King Sil (mentioned in no other context but this) and his horse in golden armor. Needless to say, no one has ever found evidence of any of these stories being true, but not for want to trying. Over the year's various excavations have been attempted. In 1776, a group of miners dug a shaft into the center of the hill, looking for a central burial chamber. They found nothing. Later, in 1849, a horizontal tunnel was bored through the hill and diggers still found nothing. As recently as 1968, a BBC-sponsored excavation was televised. The researchers found three distinct periods of construction, but nothing else. None of these excavations were suitably back-filled and in 2000, the consequences of all that digging resulted in the collapse of the summit, opening a 45-foot-deep crater. English Heritage, who manage the site, have since filled the various excavations with chalk and stabilized the hill. Today they are focused on seismic investigation and some limited excavation. Plus, they and experts from seven universities studied materials from the 1968 excavations. Here's what they found and the conclusion they have now come up with. Scientists analyzed materials from the last major excavation. They looked at flint and antler tools, as well as biological materials such as insect and snail remains and pollens. The result is, they think that the construction of this extraordinary mount was not deliberate, but a bi-product of about a hundred nearby activities. There may have been a ritual of some kind that resulted in chalk and soils from various communities being deposited on the hill, but apparently it's final appearance was totally unintentional. If you pile up stones and chalk and soil in the same spot, over and over, then pound stakes into the ground to keep it all from tumbling down and covering the landscape all around, what you end up with, after 100 years, is a mount the size of Silbury Hill. They also learned that the Romans built a road and settlement near the bottom of the hill. And, during the Middle Ages, the top — which had been a dome — was flattened, possibly as a look-out. And that, after millions of dollars of excavation, back filling and study, is all that is known. 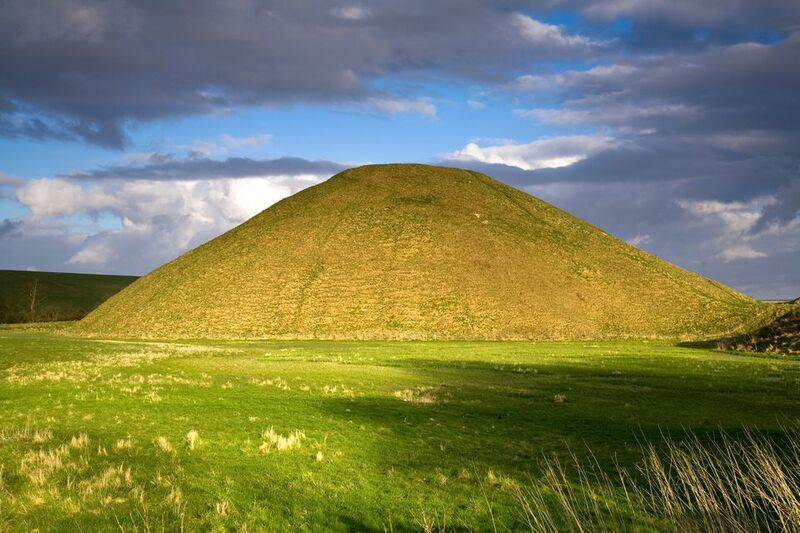 Let's be honest; despite the impressive appearance and mysterious history of Silbury Hill, there is only so much time you can spend staring at it from a distance. Luckily, there is plenty to do nearby. The hill is part of the Stonehenge, Avebury and Associated Sites UNESCO World Heritage Site. If you are interested in mysterious, prehistoric sites, Avebury Henge Europe's largest and most complex Neolithic site, is less than 2 miles away. It has an enormous (if mostly invisible) stone circle and a museum as well as the home of the man who bought the land it stands on, just to save it. Stonehenge, with its museum and visitor center (new in 2013 and a great improvement to the site) is only about 6 miles away. And near Stonehenge, England's Woodhenge, is a mysterious series of circles in the landscape, only recently spotted with aerial photography and now marked out with wooden posts. You can easily spend a whole day immersed in antique hunting in Hungerford. The town, about 16 miles east of Silbury Hill via the A4, is one of the best towns in England for antiquing, with loads of individual antique shops and several great antiques markets and flea markets. Marlborough, about six miles to the east, is another charming market town. Marlborough College, an alma mater of the Duchess of Cambridge (the former Kate Middleton), has a mound of its own on its grounds, said to be the burial place of Merlin. When: Open every day during reasonable daylight hours. How Much: The site and parking in the small observation area are free. How to Visit: The viewing area has free parking for about 15 cars, is paved and has path from the parking lot ends in a locked gate. That's about 550 feet from the hill, which is as close as you can get for a good look. The A4 road passes much closer but it is a busy road with no place to stop and park. Note: There is no access to the hill itself to protect its delicate structure. Drone overflights are not permitted.